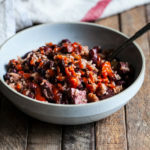 As I mentioned not too long ago, this month of blog posts is dedicated to simple recipes, meal planning, and recipes that aren’t really recipes at all: in other words, ways of throwing together ingredients for the sake of quick, tasty, nutritious meals. 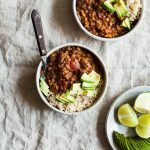 These slow cooker chipotle lentils are a recipe, but because they’re made in the slow cooker, they couldn’t be easier. 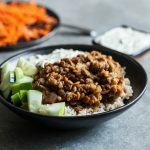 What you do with the lentils? That can absolutely qualify as a non-recipe recipe. I made these over a month ago (I’ve just been really slow in posting them), and once I had them, I used them in bowls, tacos, on toast, and even tossed them with pasta and some cashew cream to create a quick chili mac. 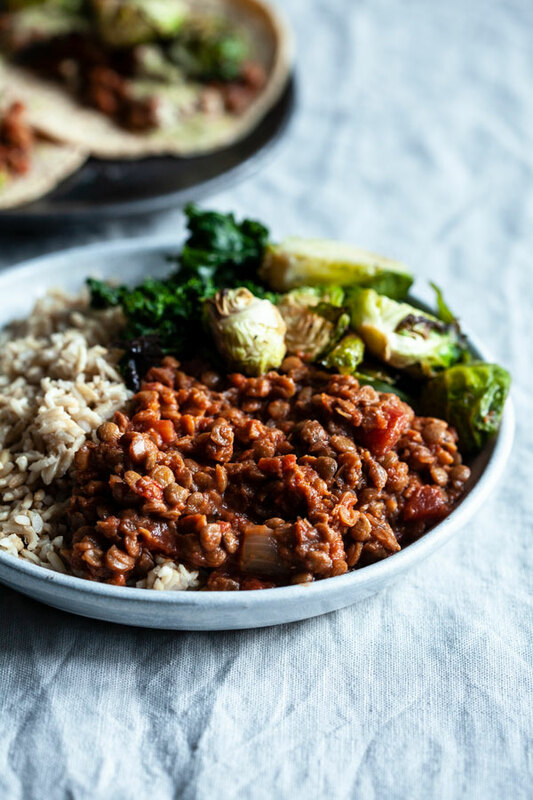 Of everything I made with the lentils (and with the leftovers, some of which I froze right away, and defrosted in the coming weeks), these quick and easy tacos were my favorite. Lentils, roasted brussels sprouts (steamed would be fine, too), and some of the hemp chimichurri sauce from Power Plates. Easy. Peasy. 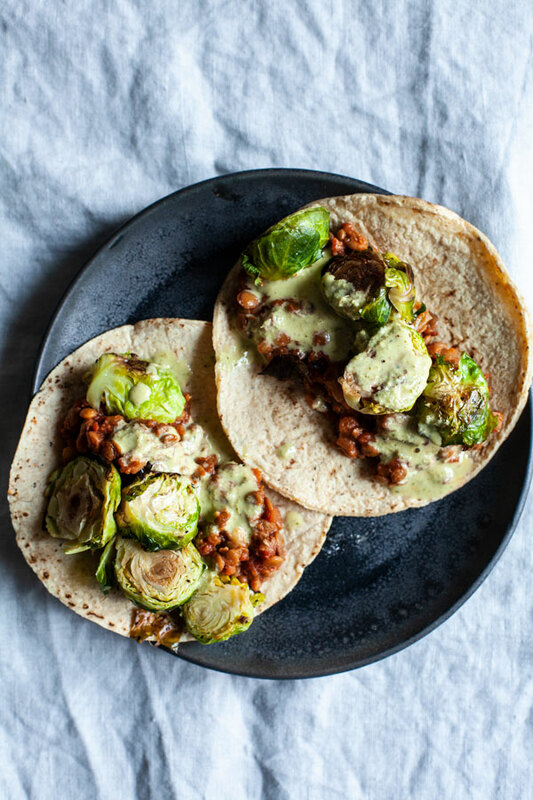 I’m used to adding cabbage slaw or kale to tacos, but I may be a Brussels-sprouts-in-tacos convert! 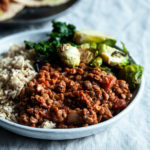 The sprouts are toothsome and hearty, which makes them a good counterpoint to the soft lentils. With that said, you could make something similar with whatever vegetables you’ve got and would like to use: I think sautéed mushrooms, roasted cauliflower, and any kind of leafy green would be lovely. Or, if you’re not in a taco mood, the lentils work perfectly with any whole grain and green you like. 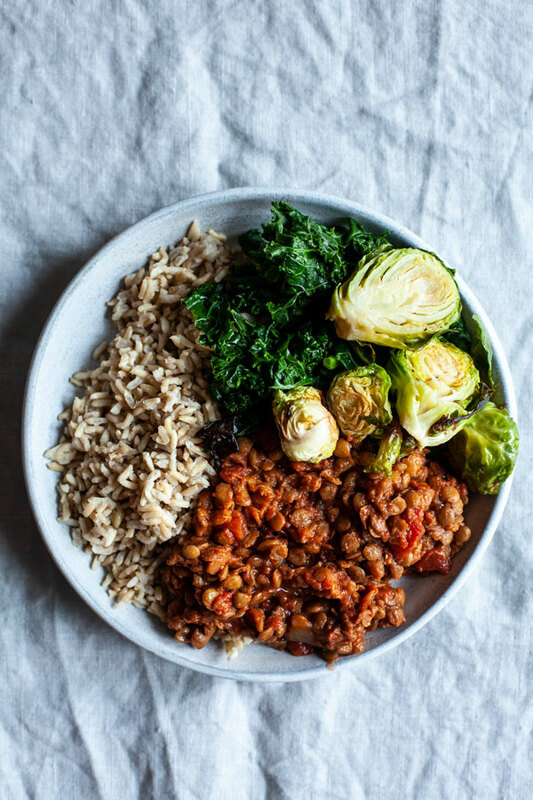 I’m a big fan of the grain + green + bean planning method for super simple vegan meals, and these legumes are a perfectly spicy, flavorful component. For most depth of flavor, begin by heating the oil in a roomy skillet over medium heat. Add the onion and celery. Sauté, stirring occasionally, for 5-7 minutes, or until the onions are gently browning. Add the garlic and sauteé for one minute more. Add this mixture to the slow cooker (or a multi-cooker with a slow cooking function), then add all of the remaining ingredients. Alternately, add everything but the oil to the slow cooker. Cook on high for 4 hours or low for 7-8 hours. If the lentils are too thick, add extra water to thin them to your liking (I like them to be thick, rather than soupy). Taste and adjust vinegar and salt to taste. Store in an airtight container in the fridge for up to 5 days, or freeze for up to 6 weeks. Life around here is slow and steady this week. I’m still recovering from a cold, but I’m in a nice place of taking good, mindful, restful care of my body. Sniffles and sleepiness aside, it feels good to move slowly, tune in, and allow myself to truly savor and inhabit the time off. I’ve got some tasty things planned for next week, including a tasty no-recipe pasta recipe, and a nutritious snack cookie that I can’t get enough of these days. Sending you all love and warmth this week. Looks great. Can this translate into an Instant Pot recipe? I don’t have an Instant Pot, but I know (or I’m mostly sure) that the machine has a slow cooker function. So I’d just recommend using that! Hi there! 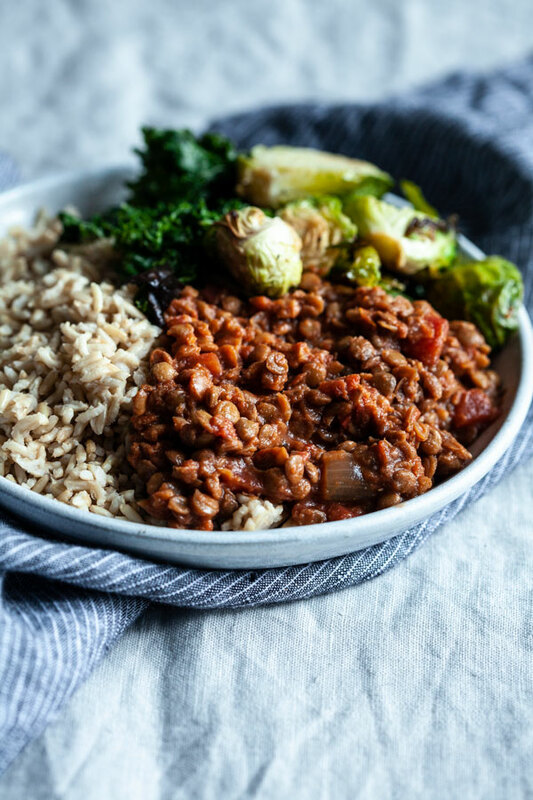 I love using my Instant Pot and convert recipes all the time. I would do the following, this is how I would. Using the sauté option on medium, add your oil, celery, and onions. Cook until the onions are golden. Add garlic, sauté for one minute. Do not add salt. Add rinsed and sorted lentils with water/broth (salted broth tends to let the lentil stay more firm and keep its shape). Cook for 10 minutes on high pressure, quick release. Add all ingredients and cook for 2 more minutes on high pressure, quick release. This looks GREAT! Seriously…got my attention. Terrific photo..brussel sprouts..everything..gonna make this one for certain. Thx for sharing! I have black lentils from Rancho Gordo. They are ‘a small black variety similar to the Beluga lentil.’ Do you think they would work in this recipe? 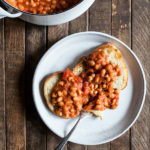 I’m also curious about the tomatoes and tomato paste…I thought that their acidity toughens beans/lentils unless added toward the end of cooking…? P.s. Lovevyour Food52 Vegan cookbook and will have to check out Power Plates soon. Hi Robin! I’ve heard that about acidity, but with the lentils in the recipe I haven’t experienced any issues with it. I do think that the Rancho Gordo variety you have will work nicely here. 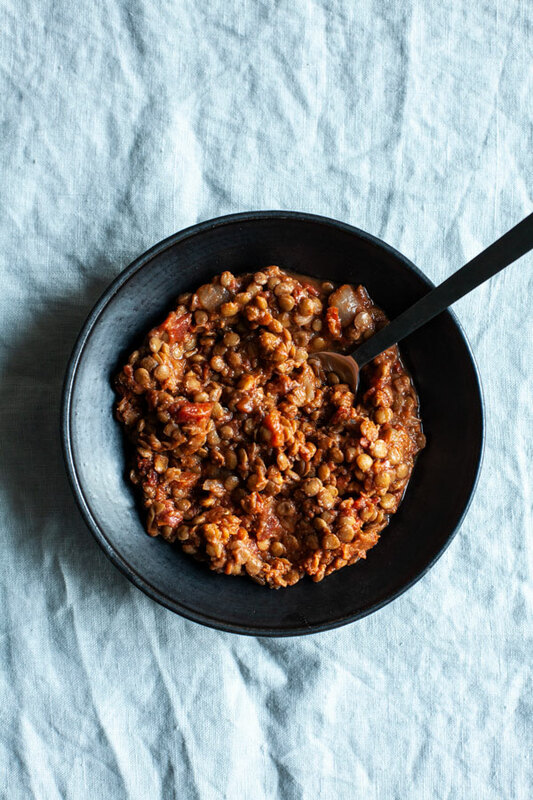 Do you soak your lentils before cooking? The package I used says to soak overnight before cooking on the stove top. So should I just soak overnight before using in this recipe? Alright sounds great thanks! One more question: how many cups Dry is 1 lb lentils? I finally made this today. Ate them in tacos with some vegan sour cream, avocado, lettuce and tomatoes. The lentils were delicious! I only recently went vegan and this was my first time making a dish with lentils that weren’t red (quick cooking) lentils. I had some leftovers today over rice with lettuce and salsa and froze the rest. Bet they’ll taste even better reheated! I had some problems with my slow cooker unrelated to this recipe so I had to order a new one! But it was my old slow cookers fault (its 15 years old), not the recipe I manage to save the recipe haha. My one suggestion would be I think I had a bit too much broth – maybe 3 cups would suffice? though this also light have been the problems I was having with my slow cooker. As well I chopped my chipotle peppers up so I didn’t have whole ones floating in the dish. I would give this recipe 5 stars but for some reason your website is only letting me enter up to 3 right now so I refrained. Can I cook this recipe on regular stove? Yes! About 1 hour of simmering time. Here we go! Able to rightfully give this 5 stars. Hayley, you’re so kind! All of the feedback is great, and I’m so glad you enjoyed the lentils. I used the Instant Pot to sauté the celery, onion and garlic; then added the remaining ingredients and cooked on high for 12 minutes. 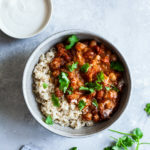 I like this recipe as it makes a lot of food for very little effort, it is inexpensive, and most importantly, it is good. I had it for lunch and it called me for dinner too.